Kesar Kaju Katli	MT-DF-1404 A twist to the usual kaju katli, here is a kesar version of the sweet. Kesar or saffron lends its tinge and taste without being too overpowering. Cashews, Sugar, Water, Saffron & Natural Food Colour. 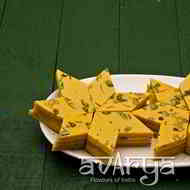 The shelf life of Kesar Kaju Katli is 15 days. Mini kaju katlis wrapped in silver varakh are sweet and pleasant. Get your share from Avarya today. Mini kesar katlis are sweet and delectable. Infused with cashews this makes for a delightful mithai. Avarya's mini rose katlis are sweet, pretty to look at and make for the best gifts. What are you waiting for order your box today.